Hong Kong (Chinese: 香港) literally means "fragrant harbour" or "incense harbour". And it's not just the harbour that offers sights and smells – there’s the food stalls, wet markets and local restaurants in locations such as Mong Kok, Sai Kung and SoHo. Hong Kong SoHo is the trendy, artsy district a stairwell or two away from the crushing party lights and sounds of the everyday Mardi Gras that is Lan Kwai Fong. However, as the economy begins correcting after the Chinese boom years that started in 2008, more and more people are spending less and less in the tri-street area of Staunton, Peel and Elgin. Even though, the customers are not coming in and rental prices remain high, some establishments are surviving. If you peruse the rental prices of retail locations in SoHo ("South of Hollywood Road") in Hong Kong, the prices fluctuate between 70,000 HKD to nearly 400,000 HKD a month. That's right – that's monthly rent. Imagine paying $50,000 USD per month for a retail store or restaurant that usually remains empty. That's why a lot of the restaurants and retail stores in Hong Kong are plastered with FOR RENT OR LEASE signs on their store fronts. So the question becomes, how are any restaurants remaining open? Enter online to offline (O2O) commerce to the rescue. However, as some restaurants struggle for customers, online delivery is keeping those restaurants that are tapped in – booming. A typical slow night for restaurants using Deliveroo and Foodpanda online to offline delivery services are making an average of 15,000 HKD to 30,000 HKD during the weekdays and double that on the weekends. Why is this trend happening, especially when most restaurants and bars are within walking distance? Let's use a little data science to break down the patterns. Pre- and post- Brexit, bankers and financiers who make up the communities that usually flood local SoHo establishments are struggling to predict the markets – and that means longer hours to follow global banking hours. That also means ordering food to the office or having it delivered prior to the taxi ride home or quick jaunt back to their flat. This information is stored via the SMS's to confirm orders and when the clock starts ticking when the order is made. Usually, dinner in SoHo means bumping into someone who is having drinks in SoHo, which means ending up in Lan Kwai Fong. And finally after 3 a.m., means ending up in Wan Chai (Hong Kong's seedy but late night haunt AKA Suzie Wong's hood). Stopping this usual pattern means not starting the pattern – even during weekends. Most are going straight home late but ordering the food they love to be delivered straight to their door because they cannot risk any distraction – as 1 o'clock in the morning in Hong Kong is 1 p.m. in New York City. What does the data reveal? Notice that bars and dance clubs cannot offer the same O2O experience because they rely on alcohol sales and physical presence. In fact, one of the most loved and longest-running dance clubs in Hong Kong announced it will be shutting down within the next couple of weeks – Club 97. This is not the first time O2O has shut down a Hong Kong party institution. Propaganda, the oldest and longest-running gay club in Hong Kong, saw its patronage drop significantly once the app Grindr was available in the app store and finally closed its doors in February of this year. Foodpanda and Deliveroo offer special promos or discounting for the food and drink bundles that most customers are buying anyway. Although local loyal customers might get a percentage or two off their bill if they visit in person because they are seen as "regulars" – online promos give more for less. 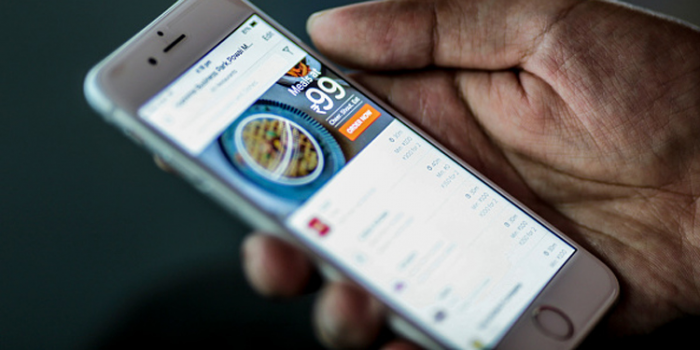 Seeing the data patterns of how certain customers are ordering food, such as Vietnamese on Mondays and Italian on Wednesdays – O2O delivery apps can promise to bring new customers to less known establishments for the same type of food. As the economy bounces around in the Year of the Monkey, it seems that those that have embraced a digital future are surviving. However, is the digital age just a crutch to keep already-skyrocketing rent prices from dropping, or is this a trend to truly create new profits? Yet, if this trend is here to stay, what new digital trend might we see next to save Hong Kong SoHo? Don your Google Cardboard using your mobile phone, HTC Vive or you Oculus Rift glasses and order virtually, but eat it at home – physically. A VR prototype of Aberdeen Street Restaurant and Bar in Hong Kong SoHo. Mmm, mmm. Just smell that "fragrant harbour" via the internet.